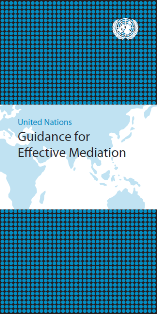 This section contains UN guidance material for setting up and managing mediation initiatives. 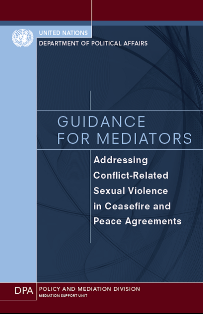 The material provides practitioners with practical advice and options in addressing some of the key challenges in mediation to maximize the chances for success. *The Department of Political Affairs is disseminating the document widely and welcomes, among other steps, its translation into languages other than the six official languages of the United Nations. Some Member States have already taken the initiative of translating the Guidance in Finnish, Slovene and in Turkish. 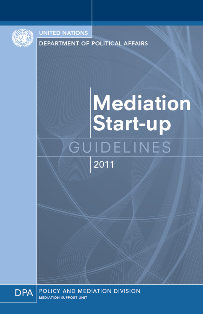 The DPA Mediation Start-up Guidelines seek to provide guidance to managers, desk officers and field staff of the UN Department of Political Affairs (DPA) on the start-up and establishment of mediation initiatives led, co-led or supported by the United Nations. Their purpose is to consolidate DPA’s institutional knowledge on strategy development, planning, support and coordination aspects of mediation initiatives. 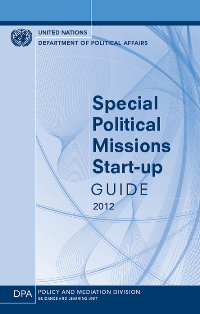 The Special political missions (SPMs) Start-up Guide provides essential information and guidance on the substantive and administrative tasks that need to be carried out to establish a field-based SPM, such as mission planning, communication, budget processes, human resources, logistics, security and legal issues. It is an essential document for all DPA staff, and for DPA desk officers and senior managers tasked to support the establishment of an SPM in particular. Tailored guidance is also frequently developed by the Mediation Support Unit (MSU) in the Department of Political Affairs (DPA) in response to a specific request from the field, often involving comparative case analysis. Such material is not generally made available beyond the requesting entity. The guide aims to inform mediators and stakeholders addressing conflicts over natural resources — whether those disagreements are violent, have the potential to turn violent, or are part of a larger political struggle, including within a peace process. It draws on the field experiences of mediators and mediation experts. 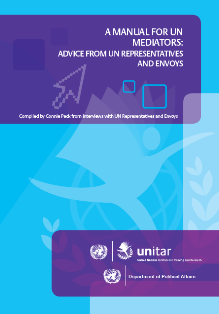 It also features lessons learned from UNEP’s work on environmental diplomacy in different conflict affected countries, with a particular focus on how to use impartial technical knowledge to equalize stakeholder information in a mediation process. Helping to identify paths towards resolution through mediation and third-party involvement, the Guide can be applied for localized and transboundary conflicts, as well as natural resource disputes that arise in the context of broader peace negotiations.